The Niagara Escarpment stretches in a wide arc from eastern Wisconsin through Michigan’s Upper Peninsula, across Ontario, Canada, and on through the Niagara Falls in New York. The rock forming the escarpment was originally deposited as lime mud on an ancient sea floor about 430 million years ago. What remains is the result of uplift, weathering, and erosion. The escarpment is home to over 240 different rare, threatened, or endangered plant and animal species, including white cedar trees that are more than 1,000 years old. It is also an important source of groundwater recharge. However, the natural cracks in the rocks and the thin layer of soil covering it leave the groundwater very vulnerable to contaminants. 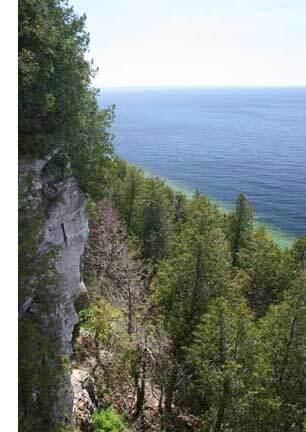 To learn more about the Niagara Escarpment, see the special edition volume of Geoscience Wisconsin.